Soba (そば or 蕎麦) is the Japanese term for noodles made from buckwheat. It is one of the many delicious traditional dishes available nationwide in Japan. There is a variety of soba dishes served throughout the year, but there are some available in specific seasons. The most well-known one is Toshikoshi Soba (年越し蕎麦) which is a traditional soba dish eaten on New Year’s Eve. This symbolizes the let go of one year’s hardship, just like how easy it is to cut soba noodles while eating. 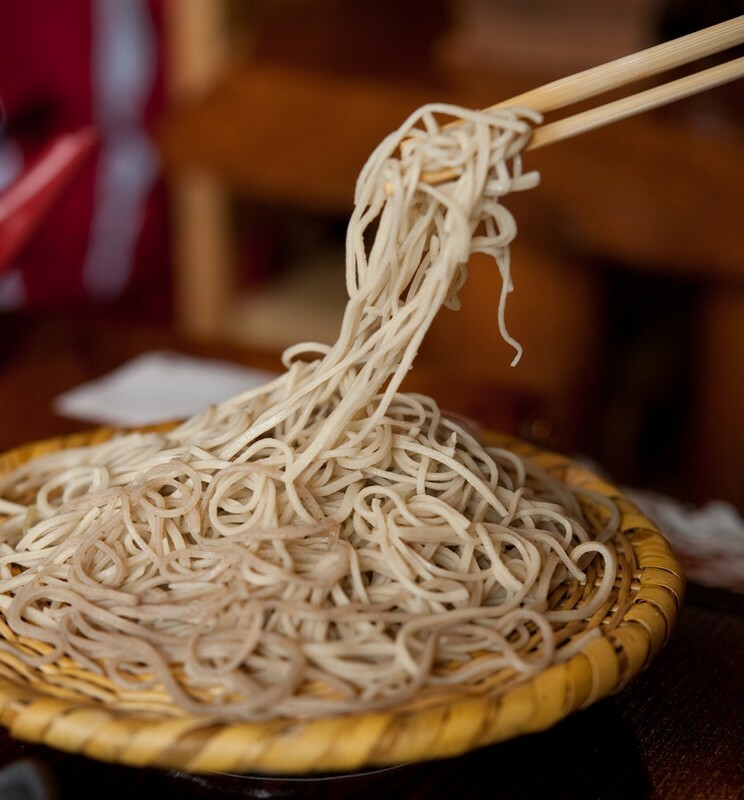 Noodles made from 100% buckwheat or a combination of buckwheat and wheat flours are both known as soba. 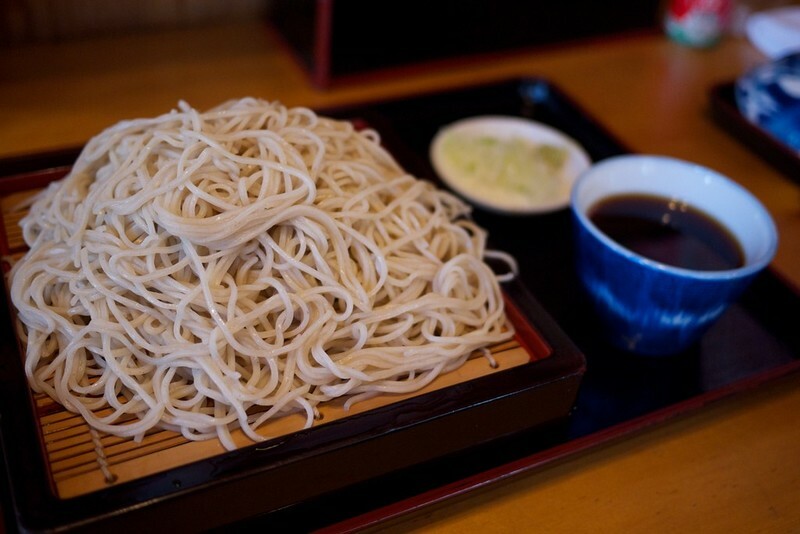 Depending on the shop, the soba noodles are usually made from 40% to 100% of buckwheat. 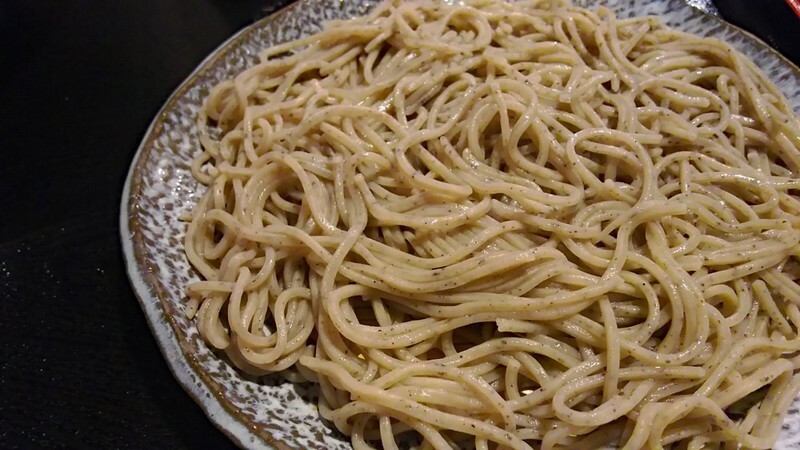 If you see that ‘’十割そば’’ is written on the menu, this means that the soba used in this restaurant doesn’t make use of any wheat flours but 100% pure buckwheat. Soba can be served in a variety of settings including both hot and cold dishes. Below are some common soba dishes that travelers will come across in restaurants. 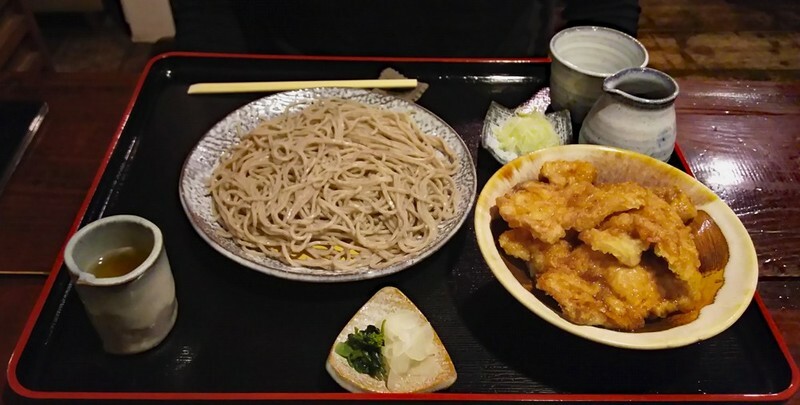 This is the most basic dish, in which the cold soba noodles are served on a flat plate or basket with tsuyu (dipping sauce) served on the side. Tsuyu is a thin and clear sauce made from a mix of dashi soup stock, soy sauce, water and mirin. Zaru and Mori Soba are similar kind of soba dishes, except that Zaru Soba is served with shredded seaweed on top of the noodles. Kitsune Soba is served a piece of Aburaage on top of the soba noodles in a hot broth. 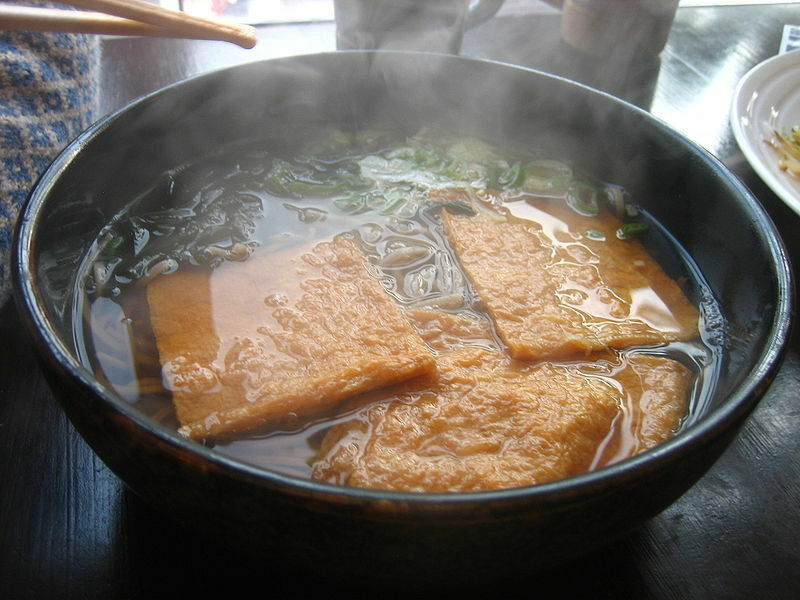 Aburaage is a piece of thin and deep-fried tofu. Tsukimi literally means moon-viewing in Japanese. 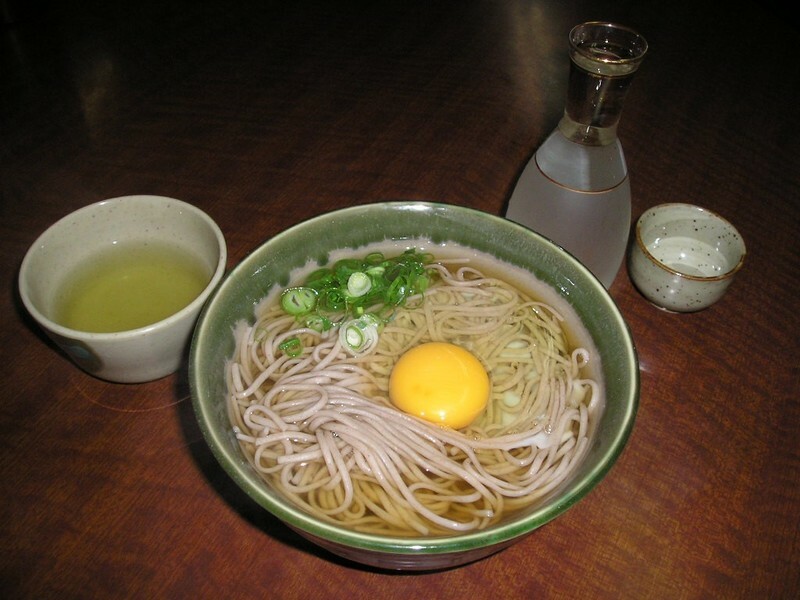 It is a hot soba dish with a raw egg served on top of the soba noodles, just like a full moon. Tempura is a Japanese cuisine which consists of either battered and deep-fried seafood or vegetables. 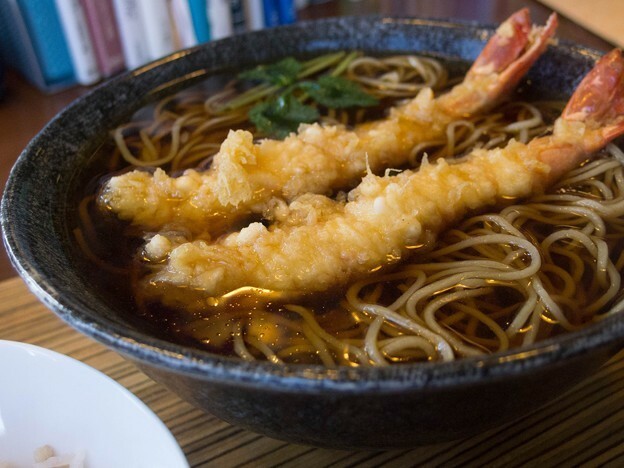 The tempura is served either as a side dish or on top of the soba noodles. It is soba noodles served with Japanese wild vegetables (known as Sansai) in a hot soup. Tororo is grated mountain yam (known as Yamaimo in Japanese), which is a paste-like sticky cream. It can either be served on the side or placed on top of the soba noodles. Eating soba is one of the easiest ways to experience the richness of Japanese culture. However, just gulping down the noodles is not the most ideal way to enjoy it. The way of eating differs depending on the soba dishes chosen. Soba served in a hot soup should be eaten as soon as possible. Use the chopsticks to bring the noodles into your mouth and don’t forget to make a slurping sound while eating! Not only does it allow the chef to know that you have enjoyed the noodles, but the slurping also enhances the flavors and enables the noodles to cool down upon entering your mouth. The broth is drunk directly from the bowl. For cold soba dishes, firstly mix the green onions and wasabi with the dipping sauce (tsuyu) provided. Afterwards, please take a few strands of soba noodles and dip them into the sauce lightly before eating them. Remember not to dip the noodles for too long or else they may lose their faint soba aroma and essence. There are some restaurants that will serve a small teapot towards the end of the meal for guests that have chosen cold soba dishes. The teapot contains hot milky water. This is called sobayu (蕎麦湯) and it is the water that was used to cook the soba. Sobayu is meant to be poured into the remaining dipping sauce when you have finished eating the soba noodles. You can then drink the soba soup similarly to how hot soba dishes are enjoyed. 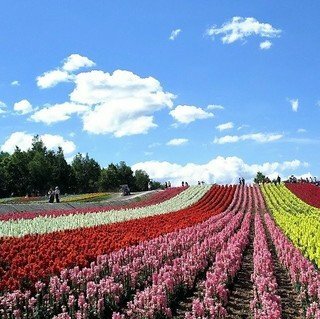 In addition to it's famous powdery snow, Niseko is also a foodies’ heaven with several delicious restaurants. 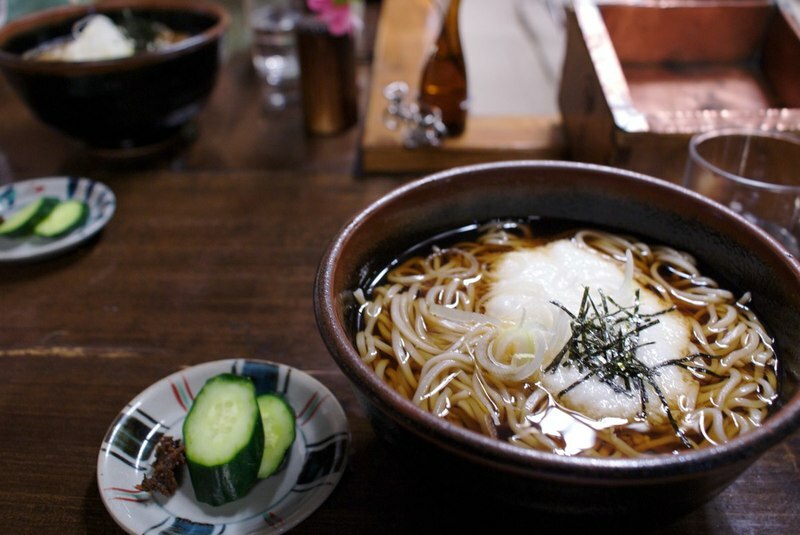 Please find below our favorite soba restaurants that no one should miss during their trip! 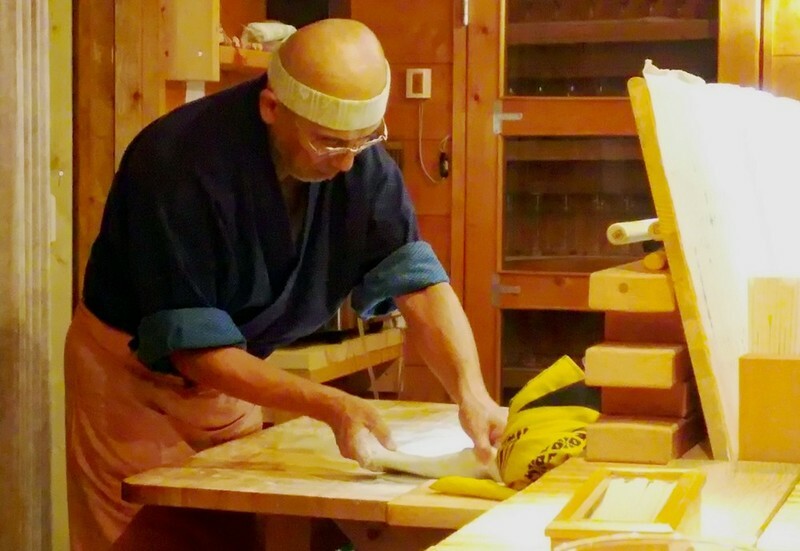 Headed by Soba Master Tatsuru Rai, Sobatei Rakuichi (樂一) is considered as one of the well-respected soba houses in Japan. 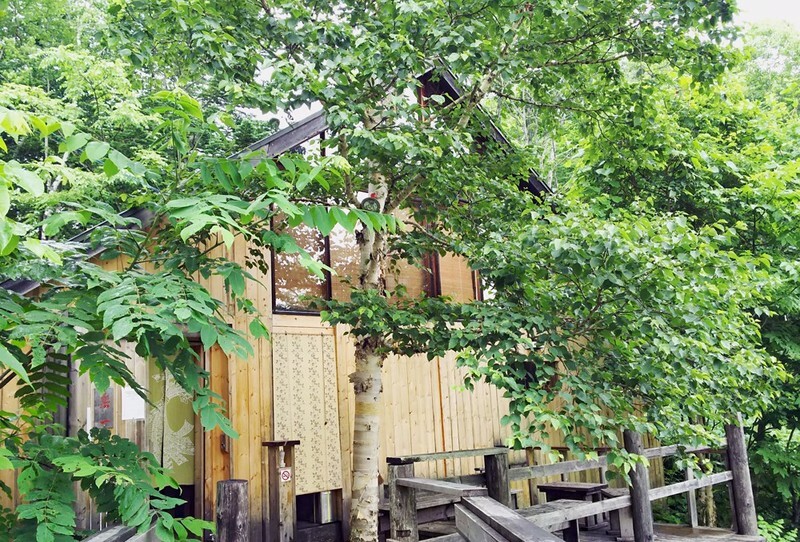 Located in the secluded corner of Annupuri, Rakuichi is a small but cozy restaurant furnished with a wooden interior. This 12-seat soba house is always fully booked for the omakase multi-course dinner. But don’t fret if you fail to secure a seat for dinner, walk-in for lunch is available too! Just remember to head down to the restaurant early to get a seat. Eager customers will start lining-up around 11h00 am every day. 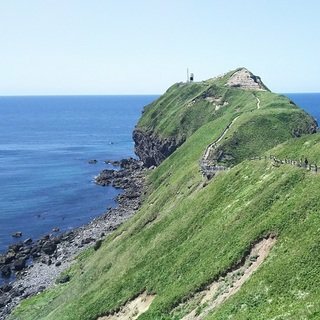 Sobatei Rakuichi is situated in a secluded corner of Annupuri. Sobatei Rakuichi is a small but cozy traditional Japanese restaurant. Soba Master Tatsuru Rai prepares the soba noodles in front of the guests. 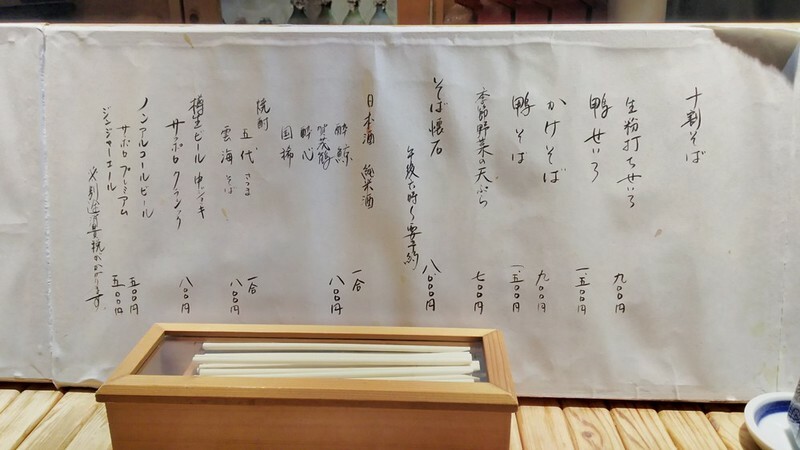 A simple hand-written menu explains the variety of soba dishes and drinks served at Rakuichi. 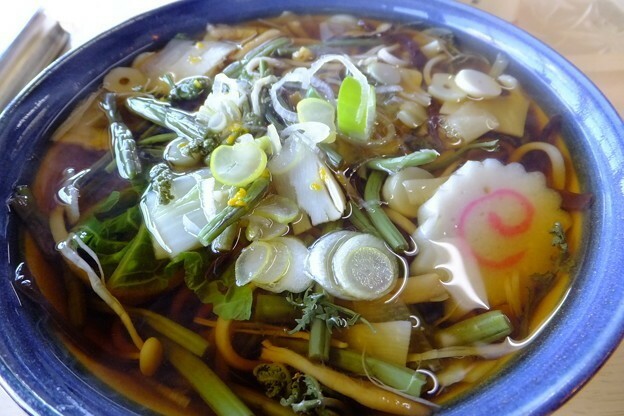 Usagiya Soba is a humble family-run soba restaurant located in Kutchan Town. 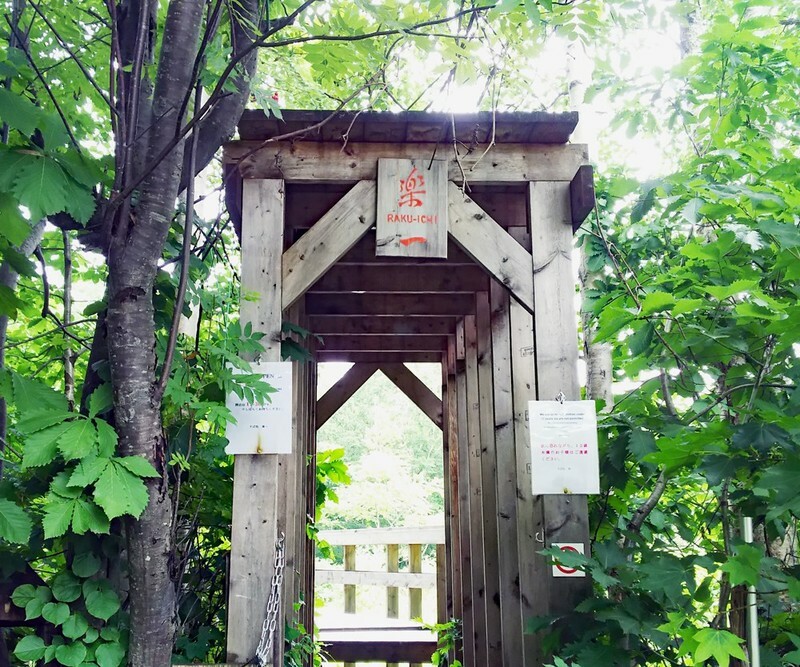 This is probably one of the best-kept secret among Niseko locals. The soba served at Usagiya is freshly made everyday and is uniquely mixed with black sesame. The noodles offer a delicate sesame aroma when eaten, which blends perfectly with the buckwheat taste. Usagiya is a humble family-run restaurant located in the center of Kutchan Town. 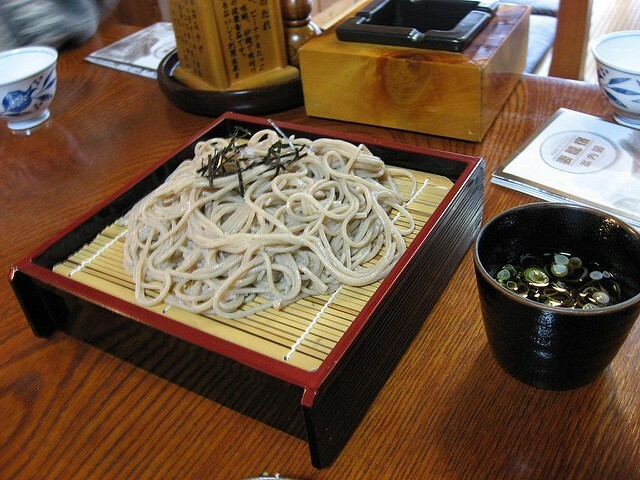 The soba noodles are made of a mix of buckwheat and black sesame. Usagiya offers a few choices of soba sets during lunch time, with the choice of either cold or hot soba noodles. 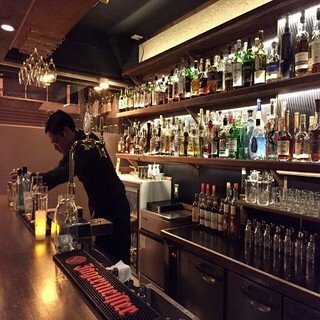 This hard-to-miss restaurant is located at the entrance of Hirafu village. When you come across this famous establishment, you know that you've reached the destination that thousands of visitors travel to. Upon crossing the small bridge that leads you inside of this idyllic restaurant, you know that you are about to experience a unique meal. Offering an extensive menu of hot and cold soba dishes, it is the best place to try the sansai soba that offers a mix of wild mountain vegetables. Ichimura's tempura is also light like no other, so go ahead and enjoy the crispy mix of vegetable and shrimp. Another great menu item is the Kamonanban soba served with duck meat. In summer or winter, you'll love the views offered throughout the restaurant. Be sure to visit Ichimura early for lunch, as seats are limited. English menus are available. 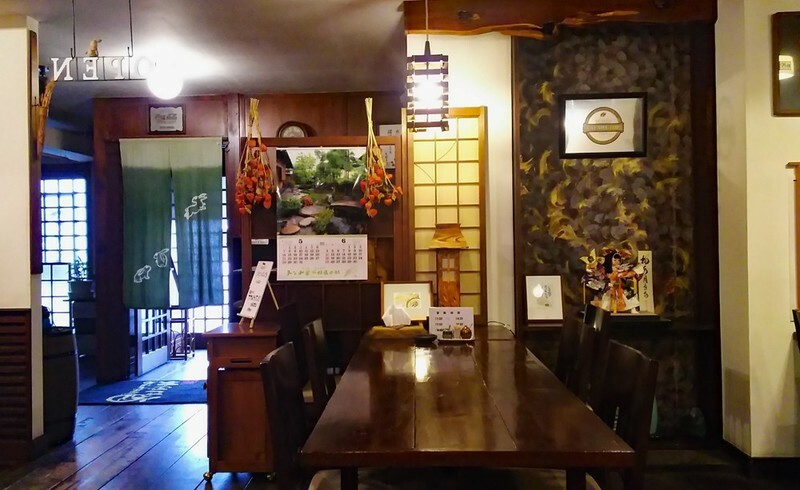 Soba Kaiseki Ichimura is located at Yamada Intersection, about 20 minutes by walk from the heart of Hirafu Village. If you are coming to Niseko this winter, remember to include one of the soba restaurants listed above! You will definitely not be disappointed! Meanwhile, don't hesitate to contact Vacation Niseko's friendly reservation staff if you need any assistance in your holiday planning!